CAPE CANAVERAL — A clandestine satellite for the U.S. reconnaissance program was successfully launched by an Atlas 5 rocket today, riding a ferocious torrent of fire and smoke off the pad before disappearing behind a curtain of secrecy. The 194-foot-tall United Launch Alliance rocket lifted off from Cape Canaveral’s Complex 41 at 8:37 a.m. EDT (1237 GMT) to cap a flawless early morning countdown. A combined 1.5 million pounds of thrust sent the vehicle to the east, along a 99-degree flight azimuth, carrying the NROL-61 payload for the U.S. National Reconnaissance Office that runs the country’s spy satellite network. The twin solid boosters burned out 90 seconds into flight, then separated about 40 seconds later when dynamic pressure conditions were apt. 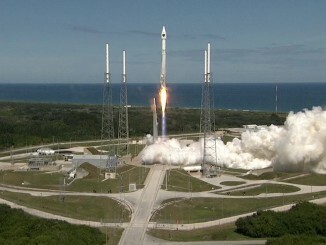 Within two minutes of flight, the vehicle weighed only half of its million-pound liftoff mass. 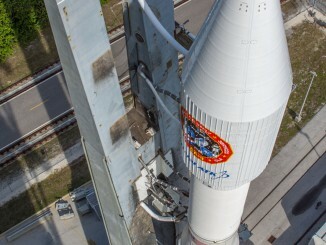 It was just one-quarter the launch weight by three-and-a-half minutes. 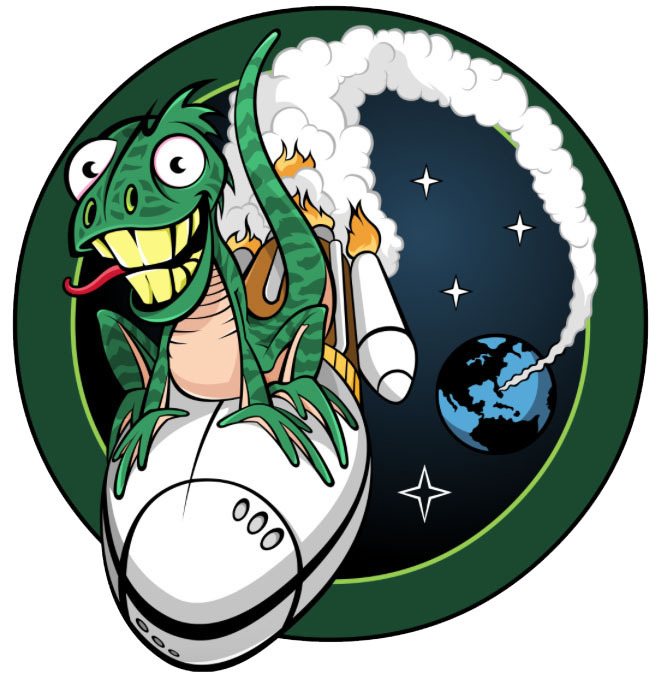 The covert payload was concealed figuratively by government classification and literally by the rocket’s aluminium nose cone adorned with a whimsical mission mascot named Spike. After a good staging, ignition of the Centaur upper stage and separation of the shroud, the launch went into a news blackout five minutes into flight, the standard operating procedure for NRO missions. A successful launch was announced via press release about two hours later. “This was a very good day for America and for our national security interests,” said Air Force Col. Clint Hunt, NROL-61 mission director from the NRO’s Office of Space Launch. 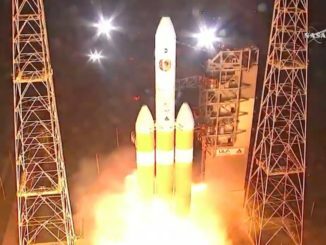 It marked the 135th successful launch in a row for the Atlas program spanning 23 years and extended United Launch Alliance’s mission record to 109 in 9 years. “Thank you to the entire mission team for years of hard work and collaboration on today’s successful launch of NROL-61. 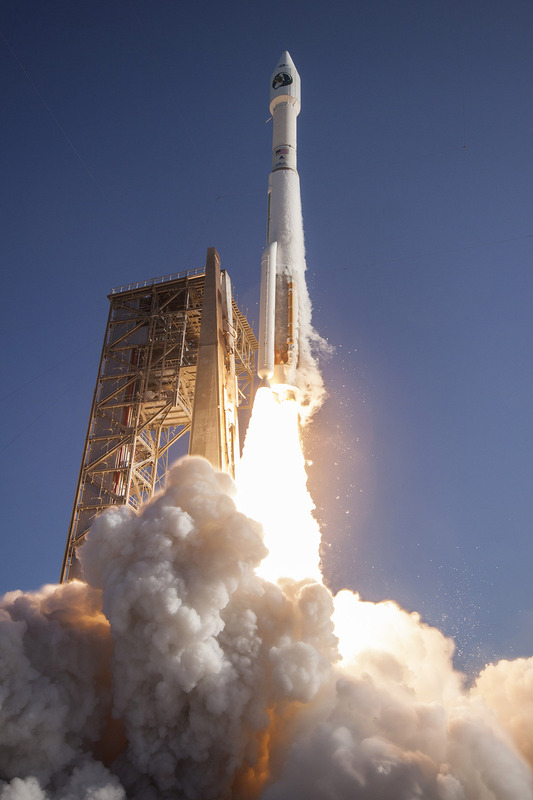 We are proud the U.S. Air Force and NRO Office of Space Launch have entrusted ULA with delivering this critical asset for our nation’s security,” said Laura Maginnis, ULA vice president of Custom Services. Experts who keep tabs on space activities say the rocket launched a new-generation NRO data-relay satellite to operate in an inclined geosynchronous orbit 22,300 miles above Earth. “I believe that the payload is the first of a new generation of communication relay for Low-Earth Orbit imagery intelligence satellites,” said Ted Molczan, a respected observer who tracks orbiting spacecraft. After a two-burn Centaur ascent profile, the NROL-61 satellite was dropped off from the Atlas 5 in a standard geosynchronous transfer orbit roughly a half-hour after liftoff. The spent Centaur was expected to deorbit a short time later and will reenter well south of Hawaii this afternoon, according to the hazard area warning issued via a Notice to Airmen. The payload will boost itself the rest of the way into a circular orbit and match the planet’s rotation to appear locked above a specific area of the globe. The NRO has relied upon spacecraft known as the Satellite Data System since 1976, when polar-orbiting photo reconnaissance birds switched from film to digital, to receive transmissions from the surveillance craft and route that information ground controllers. Hobbyist sky-watchers have routinely tracked such NRO satellites in geosynchronous orbit since the original was launched by space shuttle Atlantis in November 1990 on the STS-38 mission. Analogous to NASA’s civilian Tracking and Data Relay Satellite System for the International Space Station and science satellites, the NRO’s SDS constellation enables the data to reach analysts much quicker than waiting for the spy satellites themselves to pass over the relatively few number of ground antennas. 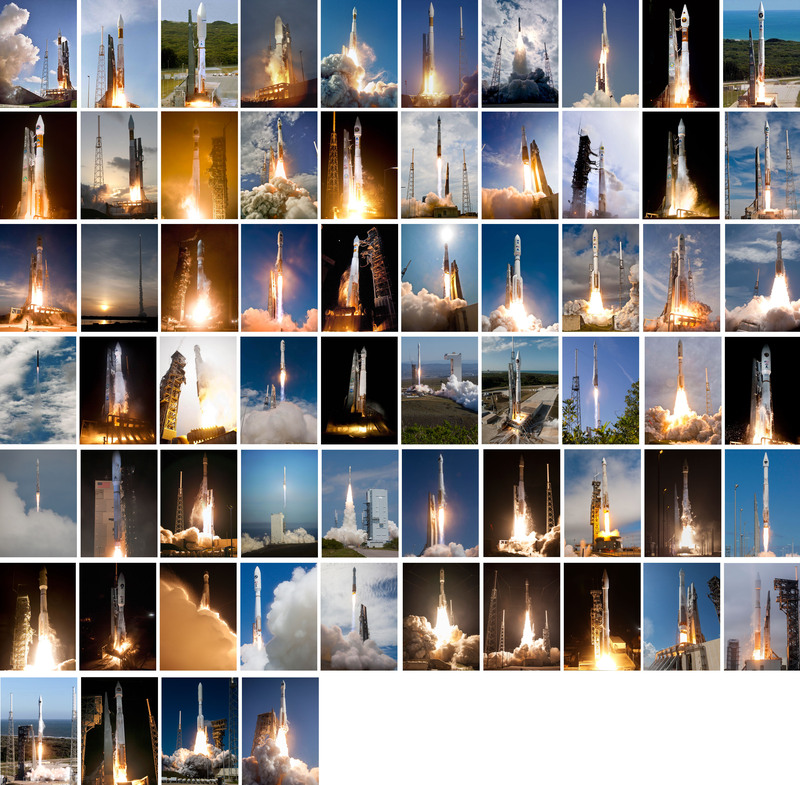 After 12 previous launches, this was the first time that the NRO used an Atlas 5 configured in the 421-variant featuring a Common Core Booster main stage with a kerosene-fed RD-180 main engine, two strap-on solids for added thrust at liftoff, a cryogenic Centaur upper stage fueled with liquid hydrogen for its RL10C-1 engine and a 14-foot-diameter, 45-foot-long aluminum Extra Extended Payload Fairing nose cone enclosing NROL-61. The vehicle is very similar to the configuration that will launch Boeing’s CST-100 Starliner capsules beginning next year. The main difference will be the dual-engine Centaur powering the craft into orbit instead of today’s single-engine upper stage. The next Atlas 5 launch on the schedule is the much-anticipated start of NASA’s OSIRIS-REx mission to Asteroid Bennu on Sept. 8 during a two-hour window extending from 7:05 to 9:05 p.m. EDT (2305-0105 GMT). The 7-year, round trip voyage will send the small probe to orbit and map the asteroid, use its robotic arm to grab a specimen of the celestial object and then return the sample to scientists on Earth. The mission hopes to gain definitive proof of what the conditions were like in the earliest stages of the solar system through the pristine regolith brought back by OSIRIS-REx.